Day four of the Pantone color challenge and going strong! Today's color is "carafe" which was decided could be a shade of brown or olive or green. So I went for a combo platter and used kind of all three. And I have to say I'm kind of in love with this outfit. It feels very me even though it's using a bit of maternity stuff. And can I say how excited I was to find this plaid skirt at the swap that actually fits?? Elastic waistband for the win once again! This is the first bit of plaid I've been able to wear in a while now and I'm so happy, I've missed my favorite pattern! This skirt should work for me after baby too, I think it's going to be a new favorite! In other news, today is the last day of our CSA share of goodies for the year. I'm so sad. I have had so much fun with all the different veggies we have received and I'm so proud of us - well mostly of Mr. Monkey - for trying out fun, interesting and unique new recipes using the items. We really ate well these last few months! I am looking forward to doing this again next year - and using the items to make baby food for our little guy too! Back to the color challenge - the word carafe makes me think of coffee, as in a coffee carafe, so I guess in a way I dressed up as my favorite beverage today. Think that would pass for a Halloween costume? I kid. I think I need to drink a little more coffee, that's what I think! 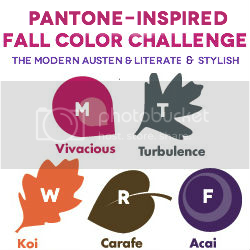 Head on over to Heidi's blog to check out the other Pantone inspired outfits or to add your own! I really like the skirt and yay that you can wear it now and after baby! It sounds like you definitely got your money's worth too from your CSA too. Our veggie garden was a trial and error this year, but we are definitely going to do it again next year. It's so nice to pick your own fresh veggies! haha, i was just thinking to myself that i wish my coffee cup would just keep magically refilling itself all day today!!! too bad about your csa ending, we loved ours this summer! I need to get a CSA for next year. I've got to remember to look into that! Lurv the skirt! Yay for plaid before and after baby! That is a very cute outfit! Glad you were able to find something plaid that you could wear while being pregnant! Great outfit - the skirt is the perfect bottom with the layered tops. That plaid skirt is super cute! It is just perfect for the fall! Very nice ensemble Bethie! Your bump is so dang cute too. You must be tall. You sure don't show much. My dd is due in 2 weeks! I am so excited. I have to get this crappy 'cough due to cold' (Forrest Gump) gone first, hopefully by then! Great outfit--very fall! You make me want to get a plaid skirt myself! My friends all love their CSA foods too. The recipes they come up with look so delicious.